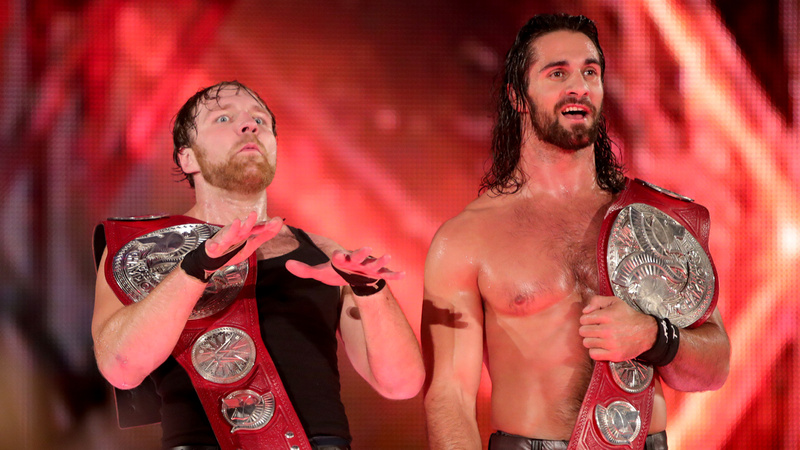 Raw Recap, September 4 – Tag Team Mayhem « Believe-In-Rollins.com | Your Most Dedicated Source for Seth Rollins! While Sheamus & Cesaro prepared to take on Heath Slater and Rhyno, Seth Rollins & Dean Ambrose happily took a spot at the commentary table to survey the ongoing match and discuss their newfound unity. Seth confidently declared that he has no doubts, or uneasy feelings towards the partnership. Ambrose states that he has no ill feelings towards Seth for his past betrayal by simply noting “these things happen.” Seth chuckles and says his partner is a forgiving guy. The two agree that though they have been “at war” in the past, they are stronger and the best when they are together. They note that Sheamus and Cesaro took some time to get along and only became the 2nd or third best tag team out there. Ambrose confidently proclaims, “the moment we signed on the doted line, those guys were screwed.” The two finally say “this is the bar now.” As Seth stands up and holds his title proudly in the air and their taunt their upcoming No Mercy opponents following the match. Rollins used Anderson as a human projectile to thwart the intrusion, rolling his foe up for the win moments later. And then Cesaro & Sheamus surprised everyone by going after the good brothers instead of the champions, getting the better of a brief, but intense fight. Even when their plans go awry, they still set the bar, and might just dictate the pace as well.